I have so long neglected this blog, that it seems it's only a place to tell my birth stories! 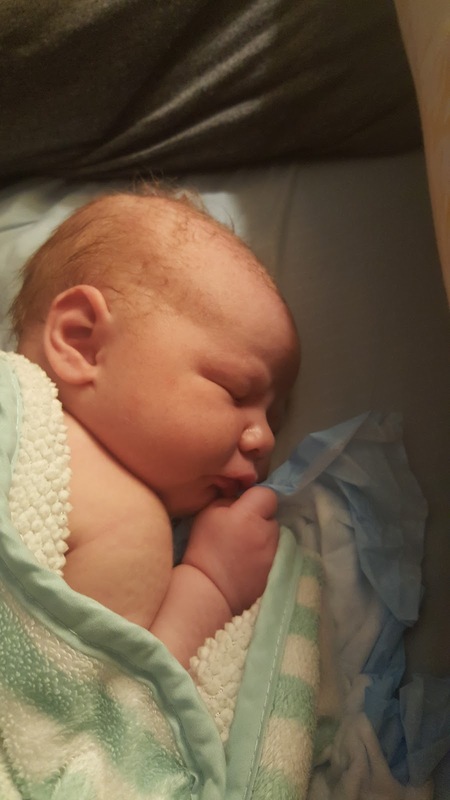 This birth for me was definitely my hardest, and as such, it has taken me a while to even want to sit down and type it up. If you've been following my blog, you will remember that my first baby was a hospital birth and my second was a beautiful, and dare I say "easy" homebirth. This birth was also a homebirth, but it was not "beautiful" or "easy." In fact, I spent most of the time very, very angry. Which if you know anything about birth, you know is not a recipe for a good birth. Because of my previous very fast labor with my second, I prepared for yet another fast birth. I was worried that it would be so fast that the midwife wouldn't get here in time. Add in a traveling husband and prodromal labor in to the mix, and it was a recipe for always being on edge. I just hoped that everyone would be able to be here and I wouldn't have to deal with the birth on my own or without the birth pool set up (I simply cannot imagine the pushing phase without the water). But there was nothing. I went to sleep on the couch but it was hard to sleep since I expected things to pick up rapidly. Morning came, and there were still no contractions. I was very tired, and I started to get worried. I had several chats with the midwife and she told me to just keep her updated. Once your water breaks, you are "on the clock." Hospitals usually give you 24 hours to deliver the baby, and my midwife was comfortable with 36 hours, but having a time limit set did nothing to make me feel relaxed! We sent the kids to my parents since I was sure things would pick up. I finally started getting contractions around noon but they were mild and so far apart. I just couldn't believe that this was how everything was happening. In retrospect it seems silly that I let this get to me mentally, but it was just the exact opposite of what I had prepared for. Around 3:00 in the afternoon, contractions started to become more painful. I started to have to stop and breathe through them. I also started feeling a little "pushy." To me, this means, wanting to push down during the contraction because it makes it feel less painful. The midwife agreed to come over and since she was an hour away, we set up the birth pool. I got in it and the midwife and my sister in law arrived. I was still smiling and able to have chats with all of them. Per my Bradley training I just knew...I just knew...and I hated that I knew it, but I couldn't be far along at all. Sure enough, when my midwife checked me, I was only at 6cm. I had felt "pushy" at 6cm with my first son also, and had caused my cervix to swell, and so I tried to stop doing it but it was hard. From here on out, my attitude just got worse and worse. I was so angry that things were going slowly. I just wanted to get this over with!! It seemed so unproductive to have these contractions spread so far apart! They were staying at 8 MINUTES apart, and as you know, contractions should be getting closer together as you get closer to giving birth (Spoiler alert: throughout the whole labor this never changed. They did not get closer together. Not even as I was pushing. Ugh.). We tried different things to get me to progress. I walked with my husband in the backyard for a while. I went in the shower for a while. Squatted on the toilet. Bounced on the birth ball. I was now in considerable pain with each contraction. My midwife checked me and I was an 8. Two hours later, I was still an 8. I was soooo angry. I wasn't even trying to focus or relax. Someone told me to relax during a contraction and I snapped at them. It was so painful and so terrible and SO slow. Inwardly, I was also worried. I knew this wasn't a normal pattern of labor. Contractions do not usually stay this far apart. My midwife tried to reassure me that "For some reason, this baby needs these contractions this far apart." But I had also heard her earlier telling my husband about her concerns of a short cord when the baby was born. They had tried to be discreet so I wouldn't hear, but I picked up on it immediately. I was worried too. I knew it wasn't normal. And this was the only baby we had never had an ultrasound with. Hours passed. I honestly lost track of the timeline. All I knew was pain and there was no progression. I got back in the birth pool and my midwife said the baby had still not engaged the pelvis. It wasn't dropping and I was still an 8. I really wanted to push. I just kept feeling like I needed to push. She told me to do whatever I felt I needed to. At some point, I think she must've begun to see that I was tired. And that things were just not progressing like normal. At least that's how I read it, though I haven't asked her about it since. She told me that she was going to stretch the cervix while I pushed. And so that's what we did. For the whole last hour or who knows long of the labor, she would stretch it while I pushed. It was a crazy excruciating finish to this birth. It was unnatural and just through her being up there pulling and me pushing we finally got him out. The last part of pushing his head out...oh my goodness. With contractions that far apart I had to just "pause" and not push even as he was crowning and I don't think anything can compare to that kind of pain. Adding to the stress of all this, was that the midwife and her assistant were having lots of quiet little chats that I couldn't hear. And they set up all their emergency equipment. Which had not happened with my last homebirth and of course, was just scary! It was not a relaxing, beautiful time. When I finally pushed him out, I just said, "Thank God, it's over." Thankfully, as soon as he was born, it was quite clear that he was perfectly healthy. Healthy and just huge. He was 9lbs. and 8oz. and had a 15 inch head (The 100th percentile for newborn heads. Lovely). I do believe that his head size contributed to the difficulty of this birth. I am a small person and it's a miracle that we were able to get him out. And, probably the worst part of this whole story, is that he had the cervix still on his head when he crowned. Yes, you read that right. I shudder still thinking of it. But my midwife had to peel it off of his head. He brought the whole thing down with him and out the birth canal. Needless to say, I was angry and brooding the whole few hours after his birth. I felt like no person should ever have to go through that. It was not a normal way of giving birth, with the midwife's hand up there pulling the baby down! I said several times for the next few days that I better either have an epidural or a C-section next time because there was no way I would ever go through that trauma again. But now five months later, I have forgotten a bit of the pain and feel encouraged to try next time to prepare for a long birth (This one was 22 hours). I know now to expect the unexpected, and I will also be praying for a much smaller baby!! Truly, looking back, I know that I should feel blessed. Because in the hospital, I would've had a C-section. A doctor would not tolerate that weird pattern of labor. Nor would they have assisted in pulling him out like the midwife did. And even though a C-section sounded better at the time, now that I have healed and have no permanent damage, I'm thankful not to have to go through the all the hoops for a VBAC next time. Feel free to comment, but please know that many comments will not make it through my "filter." Polite, reasonable, lovely, and sensible comments are always permitted. Rude, hateful, and deliberately disagreeable comments are not. I'm a stay-at-home wife and mother to three under three--all boys! I am passionate about interior design, cooking, homebirth, homeschooling, and am pursuing minimalism in our home to help me spend less time on stuff and more time with my family.